I am currently working at the University of Tennessee with Dr. Gordon Burghardt, studying behavioral ecology and evolution. In 2012-2013 I was participating in a whooping crane reintroduction project in Louisiana; my work involved research on crane behavior and ecology, remote tracking, landowner education and public outreach, herpetological and mammalogical surveys. 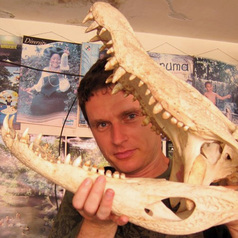 In 2011, I got a Ph.D from the University of Miami, studying the evolution of long-distance communication systems in crocodilians (adviser Dr. Steven Green). Later I did some follow-up studies on other aspects of crocodilian biology, such as tree climbing, coordinated hunting, and using tools. I have also studied zoonotic diseases (plague and Sin Nombre hantavirus) in the American West, saola ecology in Vietnam, woolly flying squirrel biology in Pakistan, ptarmigan ecology in the High Arctic, ungulate conservation in Israel, European mink ecology in Russia, and other interesting subjects.